Maryam & Marzieh: Acquitted and free! Fourteen months after they were arrested for their Christian faith and activities, Maryam Rostampour and Marzieh Amirizadeh have been acquitted of all charges by the Iranian judicial authorities. However, they were warned that any future Christian activity in Iran will be seriously dealt with. [On] Saturday May 22, 2010, they left Iran and arrived safely in another country. Sam and Lin Yeghnazar, founders of Elam Ministries and spiritual parents to Maryam and Marzieh, met them at the airport. It was a tearful reunion. Maryam and Marzieh were arrested in March 2009 because of their Christian faith and were repeatedly placed under great pressure to recant and deny Jesus Christ. They faced repeated interrogations, weeks in solitary confinement, and unhealthy prison conditions. Both became seriously sick during their imprisonment and did not receive the treatment they needed which greatly increased their suffering. Senior judges and officials also intimidated them. Despite this, they remained faithful to Jesus Christ and did not deny Him. After their conditional release from prison in November 2009, they have had a very trying six months waiting for their case to be heard in an Islamic court where they could have been sentenced to prison again. “We have seen the Lord do miracles over and over again. He kept us and gave us favour in prison, and sustained us during a very difficult period of waiting for our final trial,” said Marzieh. Maryam and Marzieh have lived through many experiences during the last fourteen months. The days ahead are not certain. However, they are determined to serve the Lord and the Iranian church. “We hope to eventually share some of what the Lord allowed us to go through to highlight the need and the opportunity for the church in Iran, but right now we will take time to pray and seek the Lord for His will,” said Maryam. Praise God for the release of these women! We encourage you to continue to pray for believers in Iran facing persecution because of their faith in Jesus. To find out more about Iran and for guidance on how to pray for its people, please click here. 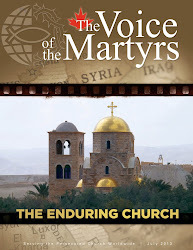 If you would like to post a prayer on VOM’s Persecuted Church Prayer Wall, please click here. For nearly a year, VOM has been following the story of six Christian hostages -- a family of five from Germany and a British engineer -- who were kidnapped along with three other women in June 2009 (click here for more information). It is the kind of story that caused a lot of fervent prayer and concern right from the beginning. With little to no updates on the situation of these believers as months went on, it was often difficult to know how to continue to most effectively pray for them. And yet, many believers around the world persisted in prayerfully beseeching the Lord on behalf of Johannes and Sabine, their children Lydia (6), Anna (4), Simon (2), and their friend Tony. Today, it was reported that Lydia and Anna have been released! Needless to say, this news is a cause of rejoicing for many. It is remarkable to read that both of these young Christians are in “good health” and that there are plans to fly them home tomorrow. Praise God! The need for prayer remains abundant, however, as young Simon is believed to have died. The status of Johannes and Sabine remains uncertain. And so we encourage you to continue to commit the situation into the hands of the Lord. Pray for guidance and comfort for Lydia and Anna. Pray that as they heal from the terrible ordeal they have endured, they will know the Lord's love in their lives. Pray for protection and health for their parents and for Tony. Pray for strength for the loved ones of these believers in these uncertain times—particularly amid the recent news regarding Simon. Imagine that your son has been sentenced to 15 years in prison for a crime he didn’t commit. Alimujiang Yimiti’s mother, Wushuerhan, faced this harsh reality in the summer of 2009, when her son was forced to undergo two secret trials before being charged with leaking state secrets to foreigners and condemned to the maximum prison sentence by the Xinjiang Courts. Authorities seized Alimujiang from his home on January 11, 2008, holding him illegally for over one year on unfounded charges of illegally spreading religion in his hometown of Kashgar. Later, the charges were changed to “divulging state secrets to foreign individuals” based on a private conversation the Uyghur Christian pastor held with an American Christian friend. For the past two years, Wushueran and Alim’s wife, Gulinuer, have petitioned police officers, government officials, and state agencies. But the officers refused to see them, even barring Alimujiang’s lawyers from visiting him in prison. Wushueran would travel miles from her hometown to stand at the gates of Alimujiang’s detention centre, crying aloud for his release, before guards could force her to leave. On April 20, 2010, Wushueran, Gulinuer, and Alim’s two sons saw him for the first time in over two years. Barely recognizing his father, Alim’s four-year-old boy could only stare at the strange man, separated from him by a wall of glass. Wushueran encouraged her son to be strong, and Alim in turn comforted his family, not knowing when he would see them again. Enraged by the injustice, Wushueran and Gulinuer now urge the international community to demand Alimujiang’s release. Hear their appeal for Alimujiang Yimiti, an innocent Uyghur Christian imprisoned for his faith, by watching the movie clip below. Alimujiang faces a long and torturous separation from his family, simply for the colour of his skin and his profession of faith. In partnership with other concerned organizations around the world, VOM partner ChinaAid urges you to sign the petition to free Alim! By raising our voices in petition for Alimujiang Yimiti, we the international community can build a brighter, more peaceful future for China and for the world. Add your voice to the thousands around the globe calling for justice today! To sign the petition, learn more details on Alimujiang’s case, and discover other ways to get involved, please visit www.FreeAlim.com. Just days ago, three buses in a convey transporting Christian students to the University of Mosul were targeted in a bomb attack. Nearly 160 people, at least 50 of them Christian students, were injured in the blasts. Radeef Hashim Mahrook, the owner of a car repair shop, was killed as he tried to help the students. According to AFP, thousands of Christians protested in northern Iraq on Monday. "We are not a minority, we are an authentic part of the Iraqi people," said a banner at the demonstration. "We ask the prime minister (Nuri al-Maliki) to stop the tragedy of the Christians," it added. As a recent graduate from university myself, the bomb attack on these students especially impacted me. When I walked the short distance from my residence to my classes, I didn't fear for my life or for the lives of my loved ones. I wasn't dealing with the fact that many from my community had fled the country, leaving everything behind. As I think of the students – some of them recovering in hospital, others now possibly planning their own exit voyage from Iraq – my heart aches that they have had to endure such violence instead of attending classes, going out with friends, and looking forward in anticipation for the future. After reading about this latest attack on the Christian community in Iraq, I again watched a short online film called Transient that features interviews with Assyrian Iraqis who have fled for Syria. In this beautiful and haunting film, the Christians share the struggles they've faced, the new lives they are trying to build, and the future they envision for themselves and their country. Hear their stories in their own words. You can watch Transient here. Yesterday the world learned of the death of Nigeria’s president, Umaru Yar'Adua. Today, acting President Goodluck Jonathan -- who had been running the nation for months during Yar'Adua's illness -- was sworn in as president. Those aware of the political and religious tensions in the nation, which recently culminated in horrific incidents of violence between Muslims and Christians (click here for more), have reacted to the news with much trepidation over how this sudden shift could intensify the instability. It is most certainly a time to lift up Nigeria in prayer. Nigeria swore in Goodluck Jonathan as president Thursday after the death of his predecessor, sparking fears of a debilitating power struggle in the ruling party. Politicians hailed the smooth power transfer, but the death of President Umaru Yar'Adua on Wednesday night after a long illness threw open the possibility of a fierce battle between the northerners and southerners in the ruling People's Democratic Party should Jonathan decide to run for the presidency in elections due next year. If Jonathan contests, it would shatter an unwritten deal in the PDP, vital to Nigeria's political stability, which rotates the presidency for eight years to a leader from the mainly Christian south and eight years to someone from the mainly Muslim north. The agreement, known as the "zoning" policy, was recently affirmed by the party and means an Islamic candidate should run as the PDP candidate because Yar'Adua, a Muslim, served less than four years. But differences over the zoning policy between top ruling party figures underscore the divisions and unfolding battle for power. Jonathan, a southerner who as vice president has been serving as the country's interim leader in recent months, has made no announcement on whether he intends to run. But some political figures in the ruling party and opposition said Thursday he would lose out on votes in the north, the country's larger voting constituency. After he was sworn in Thursday, Jonathan said he took office in sad and unusual circumstances and described Yar'Adua as a man of integrity and humility. He declared a week of mourning. Yar'Adua was due to be buried later Thursday in his northern home city of Katsina, where he presided as governor from 1999 to 2007 before taking office as president. Yar'Adua's frequent bouts of illness undermined his presidency and prevented him from delivering on pledges to reform Nigeria, attack corruption and implement the rule of law. He had suffered a kidney ailment since the 1990s. Last November, he flew to Saudi Arabia for medical treatment for pericarditis, inflammation of the sac around the heart. He failed to formally hand over executive powers to Jonathan and was never seen in public again. The legislature's vote to hand executive powers to Jonathan in February was condemned by some lawyers as unconstitutional – and Yar'Adua's return soon after deepened the political crisis. Presidential aides were accused of trying to cling to power, with Yar'Adua on his death bed. Jonathan was repeatedly prevented from meeting the president. Yar'Adua never addressed the public, and no clarity on his health was offered before Wednesday's announcement of his death. PDP Chairman Vincent Ogbulafor said recently the presidency would remain with the north after the 2011 elections, in accordance with the zoning policy. Nigeria, the world's eight-largest oil exporter and Africa's most populous nation with 150-million people, is almost equally divided between northern Muslims and southern Christians. Since independence in 1960, the volatile and ethnically diverse nation has suffered chronic bouts of ill governance, whether by military or civilian rulers. Billions of dollars in oil wealth have been stolen or squandered by the corrupt political elite. Yar'Adua was widely seen as a man of integrity and honesty. He came to office promising reform, but he lacked the political strength to counter widespread corruption. In recent years, the country has been wracked by violence in the volatile oil-producing Niger Delta, with attacks on oil facilities and kidnappings by rebel groups demanding independence for the region. Yar'Adua, determined to increase flagging oil exports, succeeded in establishing a shaky peace in the region by introducing an amnesty for rebels, many of whom surrendered arms. But there were other flare-ups, with renewed ethnic and religious violence in Plateau state, central Nigeria, that left hundreds dead in the last few months. And in July last year, security forces violently crushed a rebellion in the north by an extremist Islamic group that calls itself Nigeria's Taliban. The group's leader and numerous others were apparently executed in captivity by security forces, undermining Yar'Adua's mantra of respect for the rule of law. On March 19, police were charged in the killings. According to a recent report from The New York Times, Gao Zhisheng has again gone missing. Gao, a Christian human rights lawyer, has faced detention and torture from authorities for defending the rights of oppressed people in China (click here to find out more). At this time, please bring Gao to the Lord in prayer. Pray for his health and safety. Pray too for continued strength for Gao’s family. Pray that they will keep their eyes on Jesus, persevere in their faith, and not grow weary or lose heart (Hebrews 10:32-39; Hebrews 12:1-3). Gao Zhisheng, a prominent human rights lawyer whose 13-month disappearance at the hands of Chinese security agents stirred an international outcry until he resurfaced in March, has again vanished, his friends said Friday. The U.S. Commission on International Religious Freedom (USCIRF) recently announced its 2010 recommendations to Congress, the White House, and the State Department that 13 nations -- Burma, China, North Korea, Eritrea, Iran, Iraq, Nigeria, Pakistan, Saudi Arabia, Sudan, Turkmenistan, Uzbekistan, and Vietnam -- be named “countries of particular concern,” or CPCs. “Over the past few months USCIRF has visited a number of human rights ‘hot spots’ where freedom of religion is obstructed and related human rights are trampled,” said Leonard Leo, USCIRF chair. USCIRF’s 2010 Annual Report documents serious abuses of freedom of thought, conscience, religion, and belief around the world. The report provides policy prescriptions for each nation on the CPC list. Further, USCIRF announced that the following countries are on the 2010 USCIRF Watch List: Afghanistan, Belarus, Cuba, Egypt, India, Indonesia, Laos, Russia, Somalia, Tajikistan, Turkey, and Venezuela. While not rising to the statutory level set forth in IRFA requiring designation as a “country of particular concern,” watch list countries require close monitoring due to the nature and extent of violations of religious freedom engaged in or tolerated by the governments.